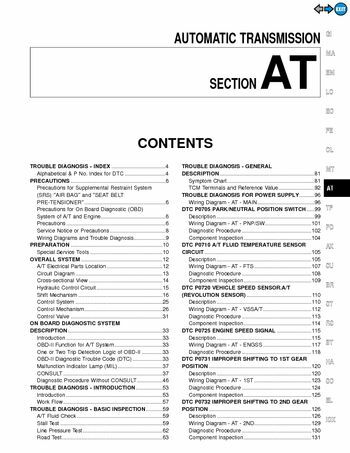 (SRS) ″AIR BAG″ ″SEAT BELT, precautions for On Board Diagnostic (OBD), one or Two Trip Detection Logic OBD-II33, wiring Diagram - AT - MAIN96. Wiring Diagram - AT - PNP/SW101, dTC A/T FLUID TEMPERATURE SENSOR, wiring Diagram - AT - FTS107, wiring Diagram - AT - VSSA/T112. Wiring Diagram - AT - ENGSS117, dTC IMPROPER SHIFTING TO 1ST GEAR, wiring Diagram - AT - 1ST123, dTC IMPROPER SHIFTING TO 2ND GEAR. Wiring Diagram - AT - 2ND129, dTC IMPROPER SHIFTING TO 3RD GEAR, wiring Diagram - AT - 3RD135, dTC IMPROPER SHIFTING TO 4TH GEAR. Wiring Diagram - AT - 4TH142, wiring Diagram - AT - TCV150, wiring Diagram - AT - TCCSIG156, dTC LINE PRESSURE SOLENOID VALVE162. Wiring Diagram - AT - LPSV164, dTC SHIFT SOLENOID VALVE A169, wiring Diagram - AT - SSV/A171, dTC SHIFT SOLENOID VALVE B174. Wiring Diagram - AT - SSV/B176, wiring Diagram - AT - TPS182, wiring Diagram - AT - OVRCSV190, dTC BATT/FLUID TEMP SEN (A/T FLUID TEMP. SENSOR CIRCUIT AND TCM POWER SOURCE)193, wiring Diagram - AT - BA/FTS195, wiring Diagram - AT - VSSMTR201, cONTROL UNIT (RAM), CONTROL UNIT (ROM)203. Wiring Diagram - AT - NONDTC207, overdrive Control Switch ″ON″ -> ″OFF″244, overdrive Control Throttle Position Switches, rear Oil Seal and Companion Flange Oil Seal. Locations of Needle Bearings, Thrust Washers, rear Internal Gear Forward Clutch Hub319, oil Pump Low One-way Clutch349, in Diagnostic Test Mode II (Self-diagnostic results), these numbers controlled by NISSAN. These numbers are prescribed by SAE J2012, when the fail-safe operation occurs, MIL illuminates, the MIL illuminates when both the Revolution sensor signal” and the Vehicle speed sensor signal” meet fail-safe condition, precautions for Supplemental Restraint System (SRS) AIR BAG” SEAT BELT PRE-TENSIONER”. (SRS) AIR BAG” SEAT BELT, the supplemental Restraint System such as AIR BAG” and SEAT BELT PRE-TENSIONER” used along with, a seat belt, helps to reduce the risk or severity of injury to the driver and front passenger certain types, the Supplemental Restraint System consists of driver air bag module (located in the center of the steering wheel), front passenger air bag module (located on the instrument panel on passenger side), seat belt. Pre-tensioners, a diagnosis sensor unit, warning lamp, wiring harness spiral cable, the Supplemental Restraint System consists of side air bag module (located in the outer side front seat), satellite sensor, diagnosis sensor unit (one of components of air bags for a frontal collision), wiring harness, warning lamp (one of components of air bags frontal collision). Information necessary to service the system safely is included in the RS section Service Manual, ¼ To avoid rendering the SRS inoperative, which could increase the risk of personal injury death, ¼ Improper maintenance, including incorrect removal and installation of the SRS, can lead to personal injury caused by unintentional activation of the system.